Sophomore Austin Caldwell waits for the elevator door to close in City Hall. Campus elevators have come under scrutiny for frequently breaking down and trapping students inside. Click to see the interactive map featuring locations and buildings where elevator outages have been reported in the last year. After her City Hall elevator rocketed to the top of the building and stalled 12 stories up, Molly Nostrand was desperate to get out. For about 10 minutes last spring, Nostrand rang the elevator’s alarm bell, banged on the metal doors and shouted for help. A voice from the elevator call box assured her that the D.C. Fire Department was on its way. Before the fire department could make it to the scene, a GW facilities worker pried the elevator doors open and helped Nostrand out. 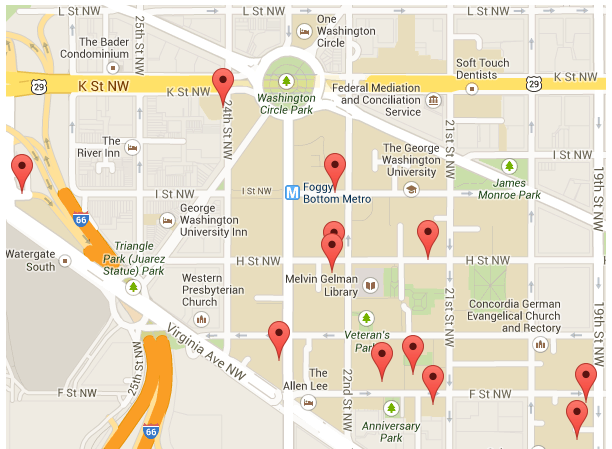 At least 71 people were trapped in residence hall elevators at GW last year in a total of 30 incidents across the Foggy Bottom Campus, according to a request filed through the Freedom of Information Act. That’s nearly double the number of incidents from the previous year, when the fire department rescued at least 59 people in 15 incidents, city documents show. Nearly a quarter of the elevator malfunctions occurred in City Hall – after D.C. Fire reported just one incident there the previous year. West End, a sophomore residence hall, had the second-highest number of stalled elevators, when elevators shut down four times, trapping at least 15. But the records obtained by The Hatchet offer only a glimpse of the issue of malfunctioning elevators on campus as firefighters are only called to the scene when an elevator stalls with someone inside. The sharp increase comes after workers were caught performing repairs on two Ivory Tower elevators without a permit last year, a violation that cost the University $2,000 and shut down the elevators until they could be re-inspected. More than a dozen students complained then that they had experienced service delays in residence hall elevators, sometimes for days at a time. While City Hall is one of the newest on campus, built in 1989, the building’s elevators were frequently out of service over the last year and logged the most outages in the fire department records. John Ferro, a maintenance manager for Vertical Transportation Systems, a private firm that does not contract with GW, said City Hall’s seven incidents in a single academic year “sounds like quite a few calls,” but added that there could be multiple reasons why elevators stall frequently. Most of the elevator breakdowns occurred with, on average, more than three people in the elevator, and the fire department’s average response time was about nine minutes, according to the documents. Elevators can stall because of factors ranging from minor electrical problems and ventilation issues to overcrowding, according to two maintenance managers at D.C.-area elevator companies. 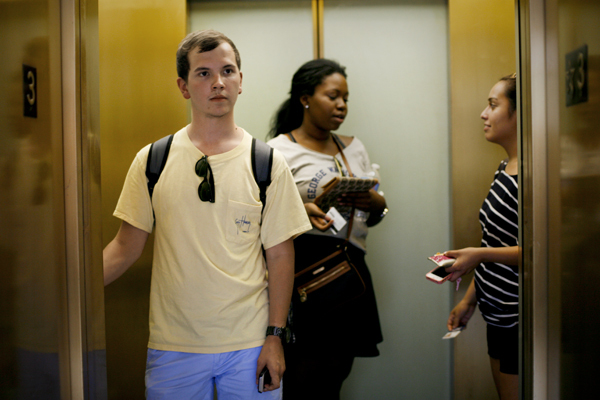 John Hofbauer, who supervises the maintenance of Georgetown and Gallaudet universities’ elevators, said constant usage – because of the 24/7 nature of a college dorm – can also cause elevators to break down. He recommends at least two maintenance visits per month for those types of high-usage elevators. GW’s elevators, however, are only serviced about four times a year, based on manufacturer recommendations, Senior Associate Vice President for Operations Alicia Knight said. The owners of GW’s Maryland-based elevator maintenance company, Capital Elevators, declined to comment and deferred media inquiries to the University. Knight declined to provide maintenance and servicing records on campus elevators and would not say how much the University spends on elevator maintenance. She added that the University’s policy is to keep “funding and maintenance records” private. GW, however, must have inspection certificates available for public view. D.C. requires semi-annual elevator checks, which are carried out by independent elevator inspectors who report to the District’s regulatory agency. The city then issues a certificate that is valid for one year. “We consistently maintain and ensure that our elevators are in safe, working condition,” Knight said, adding that the University conducts “ongoing preventative maintenance” to maintain the 120-plus elevators on the Foggy Bottom Campus. At GW, a school hailed by The Princeton Review for having the 10th-nicest dorms in the country, the increasing number of elevator failures pushes back against the University’s golden reputation. That good name has started to fade recently, as complaints also came to a head this summer when residents protested their room conditions, accusing GW of ignoring the problems and overcharging them for subpar conditions. But GW pours millions into renovating its older residence halls each year, most notably its $130 million “superdorm” project that will connect three buildings, all built in the 1920s. The University has invested a combined $5 million in elevator and building safety upgrades in four residence halls over the last two years. Still, elevators in those halls – Guthridge Hall, Munson Hall, Strong Hall and The Dakota – continued to stall last year. New controllers were installed this summer in The Dakota’s elevators, costing GW about $300,000, according to the University’s fiscal year 2013 budget. During the last academic year, The Dakota’s elevators trapped people three times. The fire department was called to rescue students in JBKO Hall three times last academic year and twice during the 2011-12 academic year. JBKO Hall is one of the oldest dorms on campus, at 68 years old, though it’s received multiple upgrades over the years. In 2009, the University spent $2.65 million on upgrades to building safety, including elevator renovations.